Pay-per-click advertising (PPC) is the fastest way to reach people online. With just a few PPC ads,n start generating clicks to your website, giving you a surge of traffic. While this traffic won’t be as sustainable as it would be from organic search, it’s still a great way to get the word out about your services and products. Keyword research: Making sure your ad appears for relevant, low-cost keywords. Scheduling for peak times: Running ads during times where conversions are most likely to take place. Budgeting: Making sure the right amount of money is being used to fuel your campaign. Expertly crafted ad copy: Writing copy that holds the reader’s attention and gets them to become a customer. Well-designed landing pages: Designing landing pages that look professional and promise a great user experience. 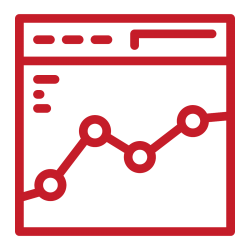 Our team can create a highly-targeted Google PPC campaign that fits your budget and produces outstanding results. Just below search engines, social media sites like Facebook, Instagram, and Twitter are among the most frequently visited sites on the web. Along with a huge user-base, these sites also offer a robust advertising platform. With it, we can deliver ads in a highly-targeted way. By making sure your ads are seen only by those who have already expressed an interest in what you’re offering, you can expect to see an impressive conversion rate. But it’s not enough to make sure your ads are seen by the right people. They have to entice the user as well. Our team of graphic designers and content writers can work to create eye-catching ads that make your case and earn clicks.